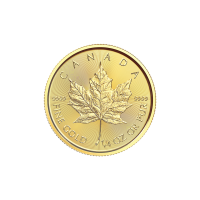 Make your purchase at our online store today and we’ll give you the lowest price on the 1/4 oz 2018 Canadian Maple Leaf gold coin. Since the Maple Leaf coins’ inception in 1979, they have sold more than 20 million ounces globally, so it’s safe to say they’re one of the most popular and anticipated coins on the market. Using cutting edge laser technology, the Royal Canadian Mint has brought the maple leaf design to life on the coin’s reverse, surrounded by a field of magnificent, light refracting radial lines. Also on the reverse, the ‘Canada’ legend, as well as the coin’s weight and .9999 gold purity. The obverse design also boasts the impressive field of radial lines seen on the reverse, along with a stylized relief of the Elizabeth II. Included on the obverse are the coin’s denominational value, the year of release and the queen’s name, Elizabeth II. Diversify your portfolio with one of these breathtaking 1/4 oz 2018 Canadian Maple Leaf gold coins today. وجه العملة تمثال للملكة اليزابيث الثانية وعبارة "Elizabeth II 10 Dollars 2018"
ظهر العملة Maple Leaf and the words "Canada 9999 Fine Gold 1/4 oz Or Pur 9999"
تمثال للملكة اليزابيث الثانية وعبارة "Elizabeth II 10 Dollars 2018"
1/4oz 2018 Canadian Maple Leaf Gold Coin Make your purchase at our online store today and we’ll give you the lowest price on the 1/4 oz 2018 Canadian Maple Leaf gold coin. Since the Maple Leaf coins’ inception in 1979, they have sold more than 20 million ounces globally, so it’s safe to say they’re one of the most popular and anticipated coins on the market. Using cutting edge laser technology, the Royal Canadian Mint has brought the maple leaf design to life on the coin’s reverse, surrounded by a field of magnificent, light refracting radial lines. Also on the reverse, the ‘Canada’ legend, as well as the coin’s weight and .9999 gold purity. The obverse design also boasts the impressive field of radial lines seen on the reverse, along with a stylized relief of the Elizabeth II. Included on the obverse are the coin’s denominational value, the year of release and the queen’s name, Elizabeth II. Diversify your portfolio with one of these breathtaking 1/4 oz 2018 Canadian Maple Leaf gold coins today.